I would like to introduce you to Junolyn's Sanrio World. It's a place that exists in my head and finally, I have started writing it out. I did a little sketching and coloring to go with these stories. On this journey, I am starting with Momoberry. In my world, Momoberry is Hello Kitty's Alter Ego. The secret is that Sanrio has been doing trial experiments on their characters, especially Hello Kitty. It's very hush, hush. No one at the Headquarters are allowed to speak of it. If one does, that person vanishes over night. It's been said that the only ones with the truth are Hello Kitty's owner, Sanrio, and the Sanrio Stalker Society's President. When Momoberry first debuted, she was introduced as Hello Kitty's look-alike. A spitting image of Hello Kitty. It was spread around that Momoberry had been randomly found in Hollywood. 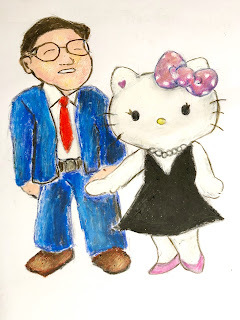 Sanrio said that Momoberry was older than Hello Kitty and very mature for her kitty age. Not long ago, someone has found her diaries hidden away. There had been rumors that Sanrio had scurried them away one night and hidden them all over the world. Yes, it is I, her #1 Stalker who will reveal her diary entries. Two entries per month. Stay tuned. Well, here is Part One of the Momoberry Diaries. Lately, you've been on my mind. How is the world out there these days? There are moments that I forget what it is like to roam about in the city. To be carefree and wild. Did you know that I would like to party it up nearly every night? I was known as Sanrio's Hollywood Starlet. I was the socialite that made things happened. If things got boring, they sent me in to stir up excitement and revert the attention back to Sanrio. I'd dazzle and charm my fans. I was the life of the party scene. I miss being the "It" girl. It was an amazing time back then. Everybody got along with each other, despite our differences. The other Sanrio socialites were friendly, but everyone knew the game. Make alliances and keep your enemies closer. We were all in competition with one another, thanks to our owner. It was a yearly battle to see who became Queen or King of Sanrio. Sanrio wanted to see who was more popular and cash out by putting the winner as the Face of Sanrio. I was the new girl in town and I had high hopes to one day be able to sit up on that throne. To be able to rock out with a crown on top of my head and hear my fans call out: "Long live Queen Momoberry! Long live Queen Momoberry!" I wish Sanrio hadn't given up on me so easily. I was only given two years at Sanrio and they decided to pull the plug. I'm still shocked to this day. I will leave you for now, but here's a photo of Sanrio and I. When the photo was taken, it was bitter sweet. Now? Not so much.